Mid range model which of course can be customised to suit your needs. 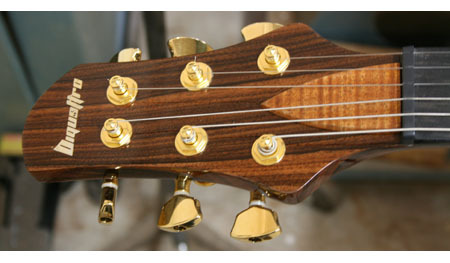 All guitars in the grande range feature a hand carved highly figured top and hand made pickup rings (usually cut from the same timber as used in the top or neck) and a long tenon set neck. 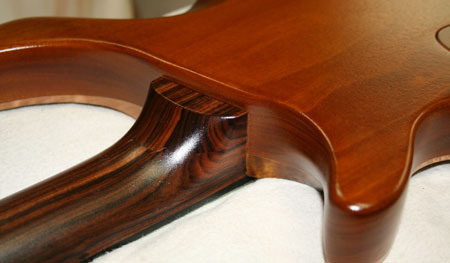 These guitars, like all of my guitars, are fully hand made. I do not use a CNC machine to cut the bodies, cut the necks or shape the tops. I work closely with you to build your dream guitar using materials carefully selected and gathered by myself over the years. 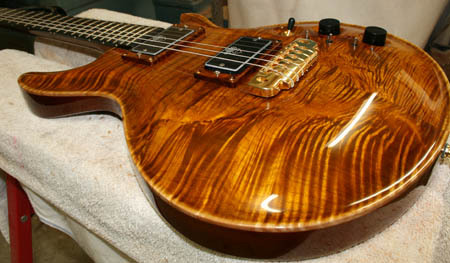 Of course, I do have customers who choose to provide their own materials and this is perfectly ok.
As for options, the guitar can be made as a solid body, a chambered body or full hollowbody with f-holes. 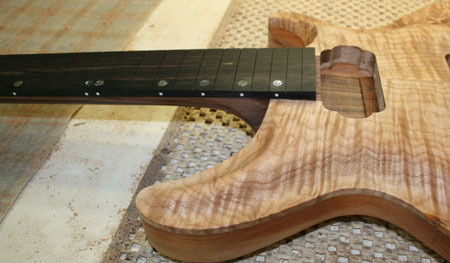 Any variety of pickups and switching can be chosen, the guitar can be made with fixed and floating bridges. Whether you choose to provide your own material or choose from my stock, the guitar will be built to the highest standard and provide enjoyment for a lifetime.